that I've never tried...Bordering Blue, Elegant Eggplant, and Rich Razzleberry! Beate's Weekend Sketch Challenge #104 was a great one to get me started with the yummy color combination:) I think this might be a sketch that Beate asked me to use from THIS CARD last October...is it Beate? I have to say I was soooo flattered when Beate asked me:) Anyway, if not...a girl can dream, right? I got my inspiration for this card from Dawn McVey's Raspberry Suite Color Challenge #18 using Raspberry, Green, Chocolate, Kraft, and Cream and from the Stamps and Smiles Sketch Challenge #37 at Our Creative Corner. 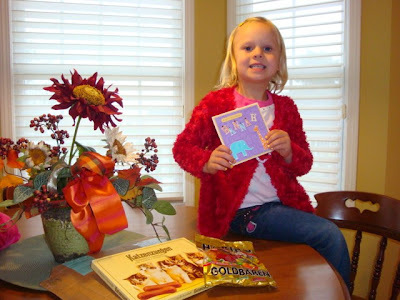 The card base is Kraft with a scallop punched Chocolate Chip lower panel under the main image panel of Very Vanilla. 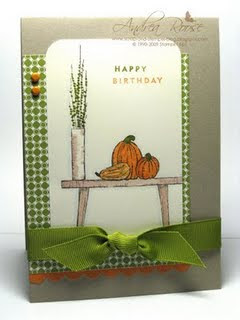 There is a peek-a-boo effect with the top half circle punch where you see a little Melon Mambo DSP and cardstock. 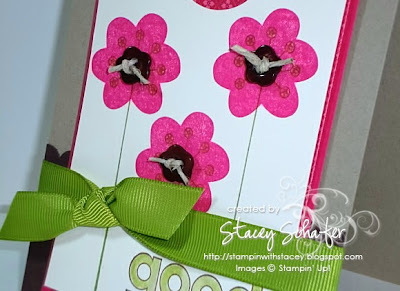 I stamped the three flowers using the Good Friend stamp set, stamped and colored in the greeting with Old Olive and a blender pen. Finally, the Old Olive 5/8" Grosgrain is wrapped around the entire card front and tied off in a square knot. 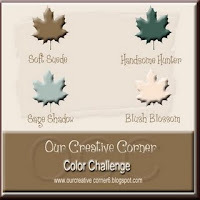 The Show Stopper for Curtain Call Color Challenge: Act 7 is Andrea Roose from Scrap- und Stampelblog...AGAIN! 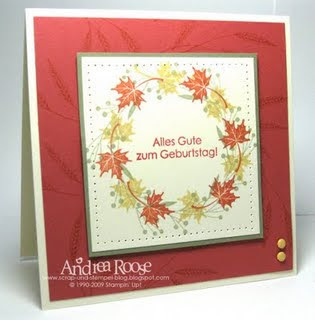 Andrea's birthday card, Happy Birthday in Autumn, is so beautiful that I couldn't help but name her the Show Stopper for the second week in a row! 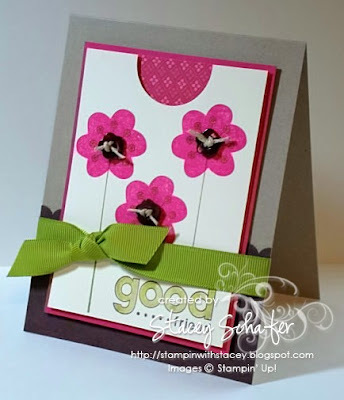 Andrea's use of the Serene Spring stamp set blew me away with an amazing layout and impeccable coloring. Congratulations, Andrea, on being a Curtain Call Show Stopper again this week! These Gorgeous Colorful Pumpkins were found at the Country Living website. Pumpkins are such an amazing source of decoration as well as an ingredient in our favorite fall recipes. The colors of the pumpkins look like Stampin' Up! 's Pumpkin Pie (of course), Old Olive, Kraft, and Very Vanilla. 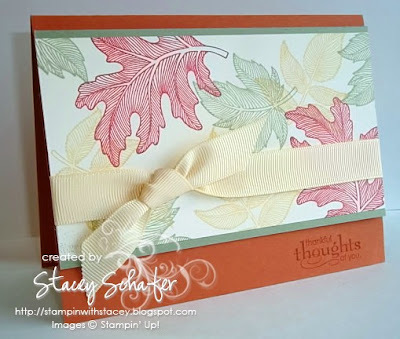 To play along in the Curtain Call Color Challenge: Act 7, simply create a papercrafted project using these Stampin' Up! colors (or similar shades from other companies), post it on your blog or other public gallery (Splitcoaststampers, Paper Craft Planet, etc.) using the keywords Curtain Call, link your posting back here, and then come back to enter your name and URL in the Mr. Linky box. You have until Sunday, October 25th at noon (CST) to enter your project. Those who are chosen as Show Stoppers will receive this award to post on their blog and share the exciting news! I will be picking more than one Show Stopper each week depending on the number of entries there are. 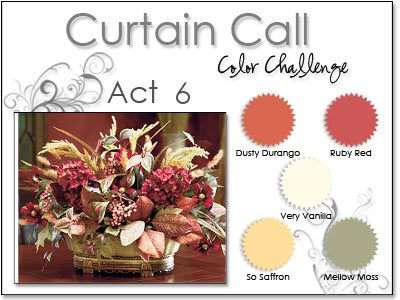 There will be one award given out for every ten Curtain Call Color Challenge entries! 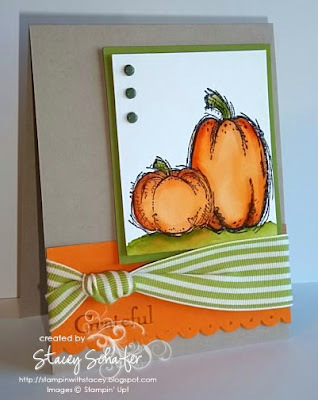 I used the Autumn Harvest stamp set for this inspired card. 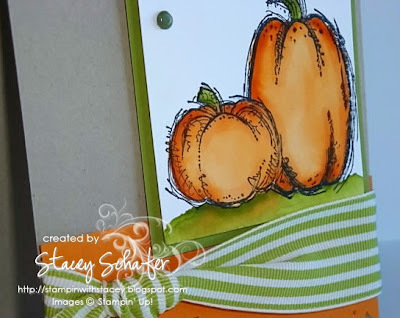 After stamping the pumpkin images on watercolor paper with Black Stazon, I watercolored using Pumpkin Pie and Old Olive Stampin' Write Markers and the Aqua Painter. 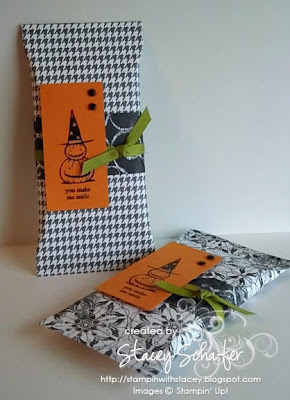 Notice the pumpkins are overlapped without the lines of the bigger pumpkin showing...that's easy, just create a mask for the image you are stamping over and viola...there you have two pumpkins sitting together! The sentiment on the scalloped edge piece of Pumpkin Pie is from the Grateful Greetings. I've missed participating in the various challenges at my favorite blogs. With this card, I used Karen Giron's Sweetest Sunday Sketch Challenge #40 and the Color Challenge at Our Creative Corner that encorporates Soft Suede, Handsome Hunter, Sage Shadow and Blush Blossom. I'm happy with how this sympathy card turned out...soft and subtle. 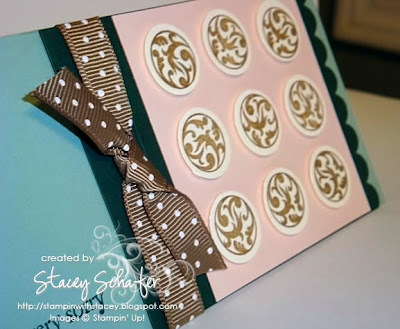 This Sage Shadow card base measures 3" X 6" with a 3" main panel of Blush Blossom loaded with 3/4" circle punches stamped with the Circle Circus stamp set, and a 3 1/2" Scalloped Edge mat of Handsome Hunter wrapped with Soft Suede Polka Dot ribbon tied in a square knot. 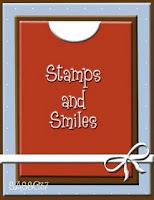 The sentiment stamped in the lower left corner is from The Three Little Words stamp set. 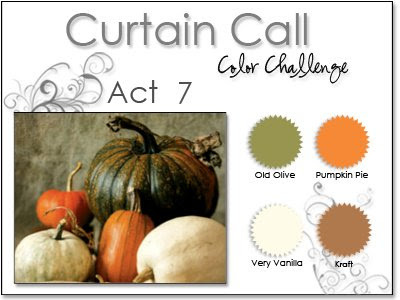 I'm working on the new Curtain Call, so check back to get some more autumn inspiration! I have been decorating the house a little for fall and have been looking online for some ideas. As I was searching, I found this beautiful autumn centerpiece called Silk Cone Hydrangea Centerpiece at Silkflowers.com. I love the rich tones in this earthy bouquet. The colors in the centerpiece look like Stampin' Up! 's Dusty Durango, Ruby Red, Mellow Moss & So Saffron. These colors will work wonderfully with a little Very Vanilla, don't you think? I can't wait to see what you all come up with! 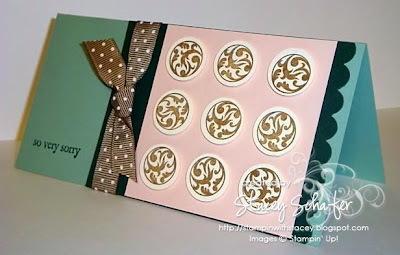 To play along in the Curtain Call Color Challenge: Act 6, simply create a papercrafted project using these Stampin' Up! colors (or similar shades from other companies), post it on your blog or other public gallery (Splitcoaststampers, Paper Craft Planet, etc.) using the keywords Curtain Call, link your posting back here, and then come back to enter your name and URL in the Mr. Linky box. You have until Sunday, October 18th at noon (CST) to enter your project. I was inspired by the centerpiece to use my Autumn Splendor stamp set once again...I'm loving this set and am using it a TON! 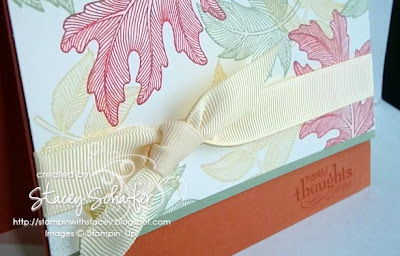 My card base is Dusty Durango layered with Mellow Moss and the Very Vanilla adhered with Stampin' Dimensionals. I used the two-step stamping technique with the leaves using Ruby Red, Mellow Moss and So Saffron ink. The main leaf panel was wrapped with a Very Vanilla 5/8" Grosgrain square knot. 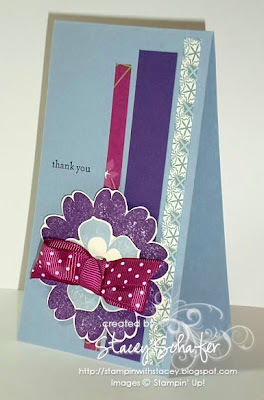 Finally, I used one of the greetings from the Grateful Greetings stamp set inked up with Dusty Durango ink. Hannah was in for a BIG surprise when we got home from school today! 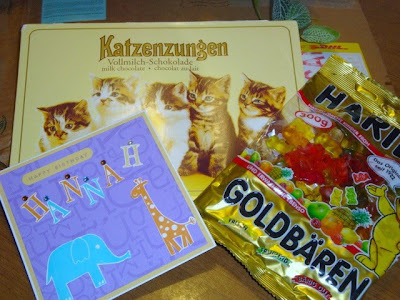 Our stamping friend, Andrea in Germany, sent Hannah a special birthday package. 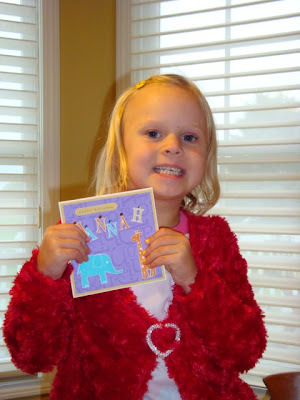 Inside the package was the darling card that Andrea made for Hannah along with some gummy bears and chocolate sticks. I want to shout out a huge "THANK YOU" to Andrea from all of us at the Schafer house. Hannah shared some of her candy with all of us:) Andrea is not only a thoughtful friend, she is a super-talented stamper....go check out Andrea's amazing creations at Andrea's Scrap- und Stempel blog! 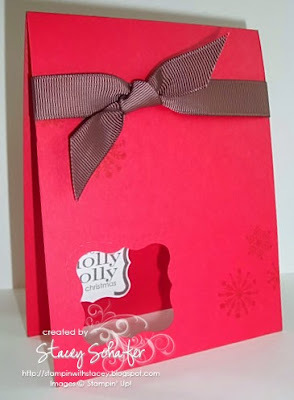 This simple and classic Christmas card was one that I demonstrated at a workshop last week. 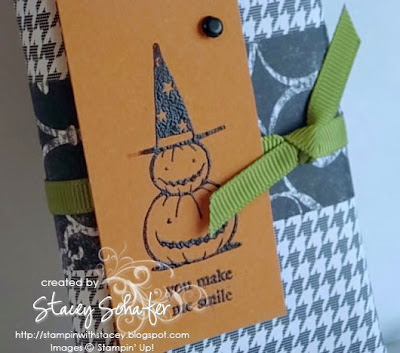 With the Big Shot, Curly Label Movers & Shapers XL Bigz die, and a few other basic supplies, I shared how to create these quick and easy holiday cards. After cutting the card template with the Big Shot and die, I stamped the snowflake image from the Christmas punch on the front of the Real Red card base. On a separate piece of Whisper White, I stamped the "holly jolly" sentiment in Chocolate Chip ink, then punched it out using the coordinating Curly Label punch. 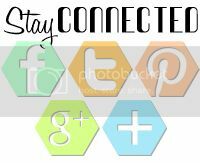 Finally, tied some Chocolate Chip 5/8" Grosgrain ribbon into a square knot around the front of the card and adhered the sentiment with a Stampin' Dimensional just inside the other Curly Label window. 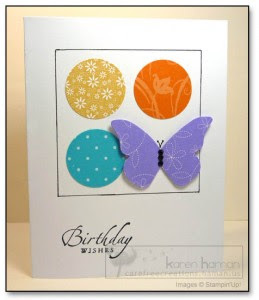 The Show Stopper this week is Karen at Carefree Creations with her amazingly clean & simple Birthday Butterfly card. I love the quadrant with that fabulous butterfly:) Congratulations, Karen...you have inspired us all with your fabulous card!